The site emits deadly carbon dioxide fumes - enough to kill a small bird flying nearby. 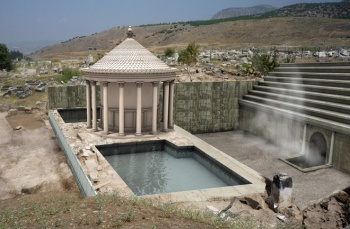 Archaeologists working in the ancient Phrygian city of Hierapolis have announced that they have found Pluto's Gate, a cave that was celebrated as a portal to the underworld in Greco-Roman mythology. Known as Ploutonion in Greek and Plutonium in Latin, the cave was described by contemporary sources as "full of vapor so misty and dense that one can scarcely see the ground. Any animal that passes inside meets instant death." While searching, the archaeologists found a site matching ancient descriptions, including a temple, pool, cave, steps leading to the cave. Francesco D'Andria, a professor of archaeology at the University of Salento, lead the team. D'Andria told Discovery news that "We found Plutonium by reconstructing the route of a thermal spring." The cave itself releases a constant cloud of carbon dioxide gas. "We could see the cave's lethal properties during the excavation. Several birds died as they tried to get close to the warm opening, instantly killed by the carbon dioxide fumes." D'Andria says that the site was a famous destination for religious devotees, and had a tourist-like attraction for ancients. "People could watch the sacred rites from these steps, but they could not get to the area near the opening. Only the priests could stand in front of the portal." The priests would have sacrificed bulls at the portal mouth, and carried live animals inside, only to later emerge with them dead. According to D'Andria, small birds would have been given to pilgrims to throw into the cave, where the bird would fall dead. The Eunuchs of Cybele, a fertility goddess, were the priests who were able to enter the cave without dying. Strabo, a greek geographer contemporary to the operation of the temple, said that the eunuchs "hold their breath as much as they can," but also ascribes mystic powers or divine providence to the eunuchs' apparent invincibility. The temple would have been dedicated to Pluto and Kore, gods of the underworld. If you like our science coverage, you'll love Geekend Update! Check it out below.